After a long winter hiatus, I really enjoyed getting back to the easel today. To get warmed up, I painted a new version of my Portage Island Cliff series. I’d been studying the cliff out the window all winter and wanted to see what I’d learned. I set “Portage Island Cliff Series No. 11” on a cloudy spring day. I liked the soft luminescence the diffused light gave to the birch tree. Sign up for email alerts to be first to know about new paintings, future blog posts, and special events. Filed under Blog. 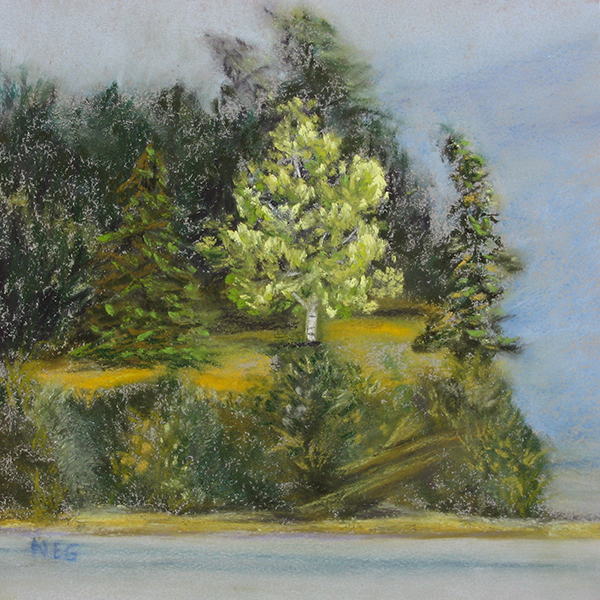 Tagged cloudy day, landscapes, pastel paintings, Portage Island Cliff 6x6 series, seascapes.